Boyhood, Birdman, The Imitation Game, The Theory of Everything, and Selma will all be nominated for Best Picture. The Grand Budapest Hotel and Whiplash have been longshots from the start, but seem in excellent position to get in now. Foxcatcher is a movie that was touted as a lock for nomination since Cannes, has fallen out of favor lately, but still has an excellent shot. Unbroken, Into The Woods, and Gone Girl are the three commercial movies which are all out of favor, but which could still make the cut. Nightcrawler and American Sniper have strong, smaller constituencies and could surprise by making it in. 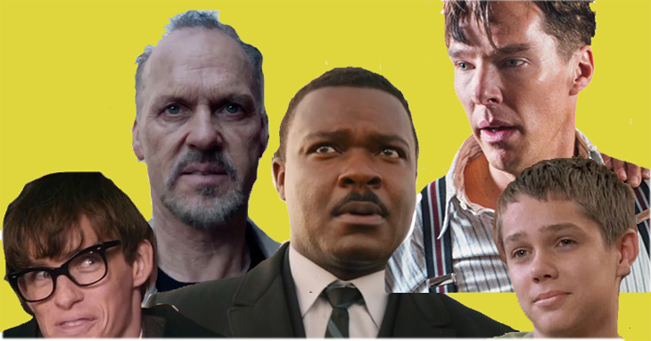 Interstellar or A Most Violent Year would be a shock Best Picture nominees at this point. Outside of this group, the party for Best Picture is pretty much over. At this point, everyone wants to know which film is going to win Best Picture. Anyone who tells you they know the answer is pulling their own chain. However, it is looking more and more like Boyhood vs Imitation/Theory with the latter two splitting, allowing Boyhood to win. Birdman is divisive, especially amongst older voters. There are a number of reasons why Selma is unlikely to win and two years in a row of “historical dramas focused on race” is amongst them, whether we like it or not. Grand Budapest is a bit too light and magical and Whiplash is too thin, however entertaining. Nightcrawler is just too brutal to win. Of the lingering left-fielders, I don’t see American Sniper even nominated, but if it got in (with the power of Warner Bros and Eastwood behind it), it could make a run at the win. But they have a long way to go, a short time to get there, and there are a bunch of detractors and distractions not far out of sight that would roll out quickly if the film got nominated. In other categories, I think JK Simmons is now settled into the win for Supporting Actor in Whiplash. Undeniable performance and a great, veteran actor having his moment. The only clear in-or-out question mark in that category is Duvall. Patricia Arquette is your likely Oscar winner in Supporting Actress in Boyhood, though strong arguments will be made for Emma Stone in Birdman and, if she gets in, Jessica Chastain in A Most Violent Year. Actor and Actress are a bit less settled, though there is a good chance that Michael Keaton and Julianne Moore will just cruise in. Eddie Redmayne, David Oyelowo, and Jake Gyllenhaal may be able to upset Keaton’s apple cart. Pushing aside Julianne Moore looks like the bigger challenge. In Director, Morten Tyldum and James Marsh are not getting much respect from prognosticators. (If you have to think twice about what movies each director, you may be in the same boat.) But both could easily get in, leaving hotter names by the wayside. Fincher, Bennett Miller, Wes Anderson, Clint Eastwood, and the currently red-hot Ava DuVernay hang in the balance of how that falls, as Richard Linklater and Alejandro Iñárritu seem like the only lead-pipe locks in the category. And if second-timer Angelina Jolie gets nominated over any of the other seven mentioned directors for the last three slots, it would be a profound shock, no matter how much the media likes to tout the possibility. Screenplay is where a lot of movies can get healthy. But again, the hip dismissal of Theory and Imitation may well not be reflective of the actual voters, leaving fewer slots for surprises like Obvious Child or Wild or Inherent Vice or The LEGO Movie or such. All of which leaves me pretty much where I started… unsettled. It feels weird feeling so unsettled when there is such narrow definition of the season. Basically, we are down to a very select group of possibilities in each category. There will be very few real surprises. But things could still settle in just as expected now… or not. There is room for change, which does not necessarily mean that there will be change. I remember two years ago when Kathryn Bigelow and Ben Affleck were locks for Best Director. There can still be surprises. But I suspect David is correct, and there will be more noms for Gone Girl than anticipated is my guess. Is it just me, or has this year proven that Harvey Weinstein’s Oscar instincts are GONE? Had he put THE IMMIGRANT out at the end of the year and pushed it, he’d be looking at multiple nominations for it in major categories and some possible wins. Had he treated SNOWPIERCER better, that film would certainly be a contender for Supporting Actress and Adapted Screenplay, and perhaps even Supporting Actor (John Hurt). He’s got THE IMITATION GAME in the mix, but it’s likely not going to win anything. I guess it’s true: the 1990s are long gone. I love John Hurt, but nothing about his brief SNOWPIERCER performance suggested Oscar consideration to me, even if the film had been a blockbuster hit.